Iran is preparing to make new oil contracts with western investors worth around $100 billion, emphasising a special new approach to business. In London in late 2015, when the situation with the sanctions becomes clearer, Iran plans to present to investors a new type of oil contract called Iran Petroleum Contract (IPC). IPC is going to be the basis contract the country plans to work with oil companies after the lifting of sanctions. Energy officials say Iran has identified nearly 50 oil and gas projects worth $185 billion for development. 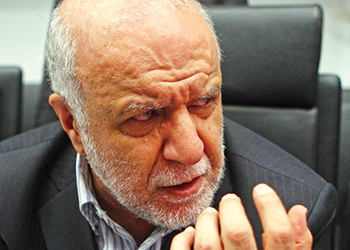 New contracts will be signed under the Iran Petroleum Contract (IPC) model which is more attractive to foreign investors, Minister of Petroleum Bijan Zanganeh says. Mehdi Hosseini, head of Iranian Ministry of Petroleum’s Oil Contracts Revision Committee, says the country will adopt "risk service contract" models. They will offer investors payback in the form of cash or oil allocation but they won’t be allowed to claim ownership of the country’s energy reserves, he says. "They would resemble production sharing but with different characteristics," Hosseini says. "The international oil company, or the investing company, would be accepting certain risks in view of which it would be entitled to a portion of the oil thus produced. Or the reward of that risk is a share/portion of the oil." Hosseini says Iran’s production costs are $8 to $10 a barrel; hence, the country’s projects will be attractive to investors. Iranian officials have expressed hope the country would be able to increase its crude production capacity to as high as 5.7 million barrels per day (mbpd) in the future. Mehdi Hosseini, a top adviser to Iran’s Oil Minister, says that Iran’s oil production will double in the short term. This, he says, will be materialised once 45 new oil projects that Iran has recently defined and plans to introduce to investors come on stream. "The cost for production of each barrel of oil in Iran is $8-10," the official says. "Therefore, our projects will be attractive to the investors," he adds. Hosseini adds that that the new projects that he says will include exploration targets will be presented at a conference in London in December. He emphasises that Iran’s oil production will exceed 4 mbpd once after sanctions against the country are lifted. The country also plans a $2.2-billion development of a field shared with Iraq to produce 50,000 barrels of oil per day, an official says, marking the first introduction of major energy projects under a new contract. The Changuleh oilfield, part of the Anaran onshore block, will be developed in two phases to produce 15,000 bpd in the initial stage before raising output to 50,000 bpd, the executor of the project Ali Abbasi Laraki says. The field will be introduced when Iran unveils new oil and gas contracts at a London conference planned for December, he adds. Three-dimensional seismic and infrastructural operations have been completed, pending the investor to be named to start development, Laraki says. The field is linked to Iran’s Azar field which the country shares with Iraq’s Badra. Iran plans to also introduce a new model of contracts for its energy projects in the December conference in London. The new model – Iran Petroleum Contract (IPC) – will be a modification of the traditional buy-back risk service contracts and has been specifically designed to increase the attractiveness of Iranian oil projects for foreign investors. The IPC offers different stages of exploration, development and production to the contractors as an integrated package. Also, Iran will set up joint ventures with the contractors to extract reserves at the fields. The contractors will be accordingly reimbursed through a share of production from the fields. "We have discussed with almost all major and medium-sized companies over the terms of the IPC as well as the new projects," says Hosseini, who chairs an expert committee at the Ministry of Petroleum which has been in charge of devising the IPC. "They have all given us positive feedback," he has been quoted as saying in the interview that has been covered by the Persian-language newspaper Forsat-e Emrooz. Iran’s oil production stood at as high as 6 mbpd in the 70s. However, its production later subsided as a result of US sanctions against the country’s oil industry as well as the Iraqi-imposed war (1980-88). Iran’s oil production rose to above 3.5 mbpd in mid-90s and even reached above 4 mbpd in early 2000s before it was almost halved as a result of US-engineered sanctions over the past few years. Meanwhile, Phase 21 of the supergiant South Pars gas field is 78 per cent complete and its gas, after being refined, will be injected to national gas trunklines by winter to boost supply during the cold, the project manager of the phase says. Alireza Ebadi was quotes by shana as saying phases 20 and 21 of the gas field are prioritised over other phases by Iranian petroleum ministry. He says the two phases will be fully operational by October 2016. Some 11 wells have been drilled at the phases of which 2 are becoming prepared for startup at Phase 21. Furthermore, 7 wells at Phase 21 and 6 wells at Phase 20 will come on-stream by October 2015, Ebadi says. Pars Oil and Gas Company (POGC) has awarded construction of offshore platforms of the phases to Iranian Offshore Engineering and Construction Company in Khoramashahr Yard. The platforms are 81 per cent complete and are expected to be transferred to their designated spots at the phases by October, says Ebadi. Pars Oil and Gas Company has started underwater pipe-laying operations for the phases, he adds. Once completed the 105-km long pipelines will deliver sour gas recovered from the phases to the onshore refining facilities in Assaluyeh, south of Iran, says Ebadi. Phases 20 and 21 of South Pars gas field are being developed for production of 50 mmcmd of processed natural gas for domestic consumption, a million tonnes a year of ethane for use by petrochemical plants, 1.05 million tonnes a year of high-quality liquefied gas for exports and 75,000 barrels a day of condensate. South Pars, divided into 29 development phases, holds 40 tcm of natural gas, or 21 per cent of world’s total gas reserves, and 50 billion barrels of condensate. South Pars covers an area of 9,700 sq km, 3,700 sq km of which are in Iran’s territorial waters in the Gulf. The remaining 6,000 sq km are situated in Qatar’s territorial waters. The gas field is estimated to contain a significant amount of natural gas, accounting for about eight per cent of the world’s reserves, and approximately 18 billion barrels of condensate. Meanwhile, Iran’s petroleum revenues had plunged from $114 billion in 2011 to $53.652 billion in 2014. 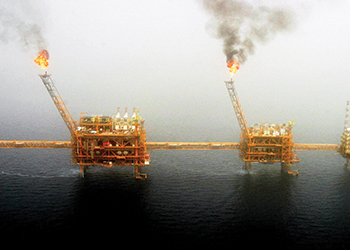 Iran’s petroleum export was $61.923 billion in 2013. Opec says Iran’s total exports reached $98.981 billion, while imports stood at $55.163 billion last year. Iran’s total exports almost didn’t change year-on-year, but its imports were $46.5 billion in 2013 and $77.8 billion in 2011. The US and EU imposed tough sanctions on Iran in mid-2012, which led to a significant decrease in Iran’s oil export. Iran’s GDP at market prices also reached $404.132 billion. The figure in 2013 and 2011 was $380 billion and $540 billion. Iran’s proven oil and gas reserves are 157.5 billion barrels and 34 trillion cubic metres respectively. Iran hasn’t been able to increase its proven oil reserves since 2012. According to Opec’s estimations, Iran’s total crude oil production reached 3.117 mbpd, about 12.8 per cent less than 2013, while it produced 212.8 billion cubic metres (bcm) of marketed gas in 2014. Iran increased its refinery capacity by 66,000 bpd to 1.781 mbpd during last year, however, its output of refined petroleum products decreased significantly year-on-year. Iran’s daily gasoline production decreased by 24.4 per cent to 344,400 barrels, kerosene production decreased by 21.7 per cent to 97,400 barrels while distillates and residuals output decreased by 0.5 per cent and 5.8 per cent to 585,600 barrels and 483,200 barrels respectively. Iran’s other kind of refined petroleum products increased by 11 per cent to 264 thousand barrels per day. In total, Iran’s refined petroleum products decreased by 7.5 per cent to 1.774 mbpd last year, while its demand for gasoline increased by 10.9 per cent to 437,600 bpd, for kerosene increased by 31.7 per cent 137,7 bpd, for distillates decreased by 13.1 per cent to 538,400 bpd and for residuals increased by 20.3 per cent to 413,500 bpd. The country’s demand for other petroleum products also increased by 1.6 per cent to 318,500 bpd in 2014. Opec estimated that Iran’s oil export decreased from 2.537 mbpd in 2011 to 1.109 mbpd in 2014. This figure in 2013 was 1.215 mbpd. Iran’s petroleum products export also reached 470,000 bpd, 19.3 per cent more than 2013, while this figure in 2011 was 441,000 bpd. The country’s petroleum imports also increased by 166.1 per cent to 40,000 bpd last year. Iran’s gas export also decreased by 10 per cent to 8.36 bcm, while its gas imports decreased by 17 per cent to 4.42 bcm during 2014. Currently, Iran has six large refineries of over 100,000 bpd, with three smaller facilities of less than 50,000 bpd each. While estimates of refining capacity vary considerably owing to the lack of reliable data from the country, we estimate that Iran now has 10 operating facilities, with a combined capacity of about 1.80-1.9 mbpd in 2014. Refinery expansion projects in 2014 could have bumped this up to a total capacity of 1.96 mbpd. Notably, large expansions at the Arak, Bandar Abbas and Lavan refineries have permitted total refining capacity to increase. All refineries are operated by the National Iranian Oil Refining and Distribution Company (NIORDC), a NIOC subsidiary. In mid-2009, Iran had an oil storage capacity of just under 60 million barrels. According to the EIA, a significant share of this capacity is located in its export terminals. Kharg Island, the country’s main export terminal, has a storage capacity of 20.2 million barrels, while the Lavan Island export terminal has a capacity of 5 million barrels. In August 2009, the managing director of National Iranian Oil Company (NIOC), Farid Ameri, told the Fars news agency that the country planned to complete an expansion of this capacity to 68.6 million barrels, although it is not clear whether the expansion has since been completed. 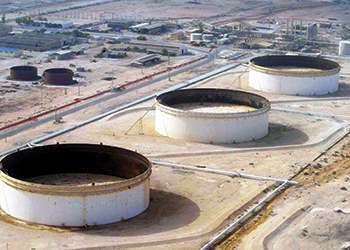 Iran has tended to supplement its onshore oil storage with the use of floating storage. In 2008, the Fars news agency reported that the country was storing around 28 million barrels of crude oil in tankers offshore. This figure declined to an IEA-estimated 21.5 million barrels as of July 2011, reflecting the way in which higher crude oil prices incentivised the sale of stored volumes. Iran has significant oil and oil products export capacity with around 10 terminals, most of which are located on the country’s south coast. The two largest terminals are Kharg Island and Lavan Island. Other terminals include Abadan, Bandar-e Mahshah, Ras Bahregan, Sirri Island, Bandar-e Abbas and Kish Island. The country also has an oil terminal at Neka, on the Caspian coast, which has been primarily used for oil imports as part of oil swap deals with producers such as Russia and Kazakhstan. The Kharg Island terminal, located 483 km to the west of the mouth of the Gulf, is Iran’s main oil export terminal. The facility, constructed in the 1960s, is linked to the shore by a 25 km subsea pipeline that starts at a pumping station at Ganaveh. During the 1980s, the terminal was responsible for around 80 per cent of the country’s crude oil exports. The facility was bombed repeatedly in 1985-1986 during the Iraq-Iran war, and exports ceased. The terminal was rebuilt in the 1990s and according to the EIA now has an export capacity of up to 5 mbpd, making it one of the largest terminals in the region. The Lavan Island terminal is linked to the island’s 30,000 bpd refinery and is supplied with crude from the nearby Lavan Group of subsea oil and condensate fields. The terminal is one of Iran’s largest, with a capacity of 200,000 bpd according to the EIA. The largest field supplying the terminal is the Salman structure, which is linked to Lavan Island via a 140 km subsea pipeline. 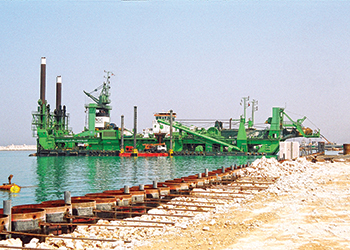 Following damage during the Iran-Iraq war, the Lavan terminal was reopened on May 1 1993. The Bandar-e Mahshah terminal was one of Iran’s main terminals prior to the construction of the Kharg island facility. Following construction, Bandar-e Mahshah was primarily used for oil product exports from the Abadan refinery. According to the EIA, Iran’s domestic oil pipeline network comprises five separate pipelines. Two oil pipelines link the country’s largest refinery at Abadan with producing areas in Khuzestan, and then further north to the Arak refinery. One of the pipelines continues further north to Tehran, and then to the oil refinery at Tabriz in the north west. Another pipeline transports oil from Khuzestan to the Esfahan refinery, then south east to the Kerman refinery, and finally to the Bandar-e Abbas refinery and oil export terminal by the Straits of Hormuz. The Esfahan and Tehran refineries are also linked by pipeline. Iran hopes to sign an agreement with Iraq to build a long-mooted oil pipeline between the southern Iraqi city of Basra and the Iranian city of Abadan, an Iranian embassy official in Baghdad said. Ali Heidari, Iran’s trade attache to Baghdad, also said that the draft agreement had been submitted to the Iraqi government and was in the ‘final stages’ of a review process. Iran and Iraq first signed a MoU to build the Basra-Abadan pipeline in February 2004 and three subsequent agreements were signed by the two governments between 2005 and 2007, all of which proposed, in various forms, a twin pipeline system conveying around 150,000 bpd of Iraqi crude to Iran’s largest refinery at Abadan and sending Iranian refined products back to Basra. An official at NIORDC stated in October 2006 that the engineering design of the pipeline had been finalised, and another official at South Oil Company stated in November 2007 that the company had already commenced work on the pipeline. Notwithstanding these statements and agreements, no tangible progress appears to have been made. In early 2013, Iran and Pakistan agreed to work together to construct the Iran-Pakistan gas pipeline with annual 7.8 bcm capacity. Simultaneously, the two countries discussed building an oil pipeline for supplying 400,000 barrels of Iranian crude oil to Pakistan as well. Iran has a large and well developed network of both domestic and international gas pipelines, with several major pipeline projects on the cards. Gas import pipelines link Iran to Azerbaijan and Turkmenistan, and give the country import capacities of 10 bcm and 20 bcm respectively. Export pipelines link Iran to Turkey (10.2 bcm) and Armenia (2.3 bcm). Additional proposed export pipelines would increase Iran’s gas export capacity to Turkey as well as enabling exports to Pakistan and India. The country announced plans to invest $6.8 billion in developing and expanding its gas infrastructure. The investment, part of the country’s fifth five-year plan, was to go towards the construction of the ninth Iranian Gas Trunkline (IGAT) pipeline; the completion of a second gas pipeline from Turkmenistan; and expansion work on three gas processing facilities at Fajr-e Jam, Parsian and Ilam. Iran’s gas transport and distribution system is currently insufficient to meet the country’s needs, meaning investing in gas infrastructure development is a high priority. Iran has previously signed a deal to construct a 660 km gas pipeline through Turkey to Europe. Under the $1.29 billion deal a pipeline with a capacity of 18-22 bcm will be built linking Iran to the EU via Turkey. Iran’s Mehr News agency says that Iran would be responsible for 23 per cent of the project, with the remaining 77 per cent handled by the Turkish side. However, no EU-Iranian gas supply deals have been struck. Iran is in the process of developing a major domestic pipeline network known collectively as the IGAT. According to NIOC subsidiary Pars Oil and Gas Company (POGC) the network will be fed with gas from the South Pars project and will comprise nine separate pipelines. The pipelines are designed to provide gas to the country’s gas-poor northern regions, possibly allowing it to reduce gas imports from Azerbaijan. The early phases of the network are already on stream, with IGAT 8 due in 2012. According to the EIA, IGAT 9 will be the first time Iran has offered a pipeline project on a build-own-operate (B) basis. The 1,475 km Kazi-Magomed-Astara gas pipeline is the southern branch of the Gazakh-Astara-Iran trunkline, completed in 1971. The pipeline runs from Kazi-Magomed in central Azerbaijan into central Iran where it links in to other gas pipelines at Rasht and Qom. The pipeline has a design capacity of 10 bcm. Actual capacity is much lower, however, and the Tehran Times estimates that following repairs it will be able to supply up to 1.8 bcm per annum to Iran. The State Oil Company of Azerbaijan Republic (Socar) intends to invest $125 million in expanding a compressor station in the border town of Astara and repairing a section of the Kazi-Magomed-Astara pipeline to allow increased supplies to be exported. The 200 km Korpezhe-Kurt Kui pipeline transports gas from the Korpezhe gas field in north-west Turkmenistan to Kurt Kui (Kordkuy) in northern Iran. The pipeline, the first to link the two countries, was opened in 1996 and supplies northern Iran with around 8 bcm per annum. Construction of the pipeline was carried out by National Iranian Oil Engineering & Construction Company (NIOEC), which won the $195 million tender in 1995. Iran opened a second gas pipeline from Turkmenistan in December 2009, further diversifying the central Asian country’s energy exports away from Russia. The new 12 bcm supply line transports gas from the Dauletabad field in the south-eastern Matriy province to Khangeran. The construction of the pipeline increased Iran’s gas import capacity from Turkmenistan to 20 bcm. Iran added over 4 bcm of Turkmen gas import capacity in late-2010 through the extension of the Dauletabad-Khangeran pipeline. Following the completion of the 155 km second leg of the Dauletabad-Khangeran pipeline, Iran will be able to import up to 24 bcm of Turkmen gas a year, helping the Central Asian producer to offset some of the fall in Russian gas import demand. The second leg of the Dauletabad-Khangeran pipeline runs from the Shahid Hasheminejad refinery in the city of Khangeran to the inner north-eastern Razavi Khorasan province. Construction was completed in late November 2010, bringing the capacity to around 16.5 bcm. The Dauletabad-Khangeran pipeline will eventually carry up to 18.2 bcm. The construction of the 2,577 km Iran-Turkey Gas pipeline began in 1996 and was completed in 2001. The pipeline, which has a capacity of 28 mmcfd; an annualised 10.22 bcm, links the northern Iranian city of Tabriz to the Turkish capital Ankara. The Iranian section of the pipeline is operated by NIOC. The pipeline joins the Baku-Tbilisi-Erzurum (BTE) pipeline, also known as the South Caucasus pipeline, at Erzurum. The pipeline frequently suffers disruptions, with supply having been cut off repeatedly in the past by bad weather and attacks by Kurdish separatists. The 2.3 bcm Iran-Armenia gas pipeline was completed in 2009 and links the northern Iranian city of Tabriz to Armenia. The Iranian section runs 140 km to the Armenian border where it meets the 40km Armenian section stretching from the Meghri region to Sardarian. The Iran-Armenia pipeline was planned to be extended by a further 197 km to take gas to the centre of Armenia and link it up to the national distribution network, although it is uncertain whether this expansion will go ahead. Under a 20-year contract signed by Iran and Armenia in 2004, Armenia agreed to supply Iran with 3 kilowatt hours (kWh) of electricity for each cubic metre of natural gas that Armenia receives from Iran. All of the gas exported to Armenia is, therefore, converted into electricity and then re-imported by Iran, with none of the gas being consumed by Armenia. Armenia plans to use the Iran pipeline to meet its own gas needs only in force majeure situations, according to Armenian energy minister Armen Movsisian, quoted in December 2008. The Armenian section of the pipeline has been owned and operated by ArmRosGazprom (ARG) since 2006. Russian gas export monopoly Gazprom holds majority control of ARG with 80 per cent of the company, while the Armenian energy ministry owns the remaining 20 per cent. Gazprom is the sole owner of the critical 40 km section of the pipeline through Armenia. Building work on the Pars gas pipeline from Iran through Turkey began in July 2009, according to a statement by the head of economic affairs at the Iranian embassy in Turkey, Ahmad Noorani. The 1,740 km pipeline will run from Iran through Turkey to Greece, then through Italy and onwards to other European countries, according to Noorani, who says that another route could go via Iraq and Syria under the Mediterranean to Greece and Italy. Noorani also says that Iranian gas could be used to supply the planned Nabucco pipeline that will run from Turkey to Austria. No contracts to that effect have been signed. Iran and Pakistan signed a ‘sovereign agreement’ in May 2009, finalising a deal to construct the long-delayed $7.6 billion Iran-Pakistan (IP) pipeline. According to the signatories, the agreement would allow the project to proceed from the planning to the implementation phase, with first gas targeted by the end of 2014. The pipeline will source gas from South Pars field and will run about 900 km from the southern port city of Asasluyah (Asalooyeh) to Iranshahr near the Pakistani border, where it will supply Pakistan’s Baluchistan and Sindh provinces. Pakistan’s Petroleum and Natural Resources Minister Naveed Qamar told reporters that the Gas Sale and Purchase Agreement (GSPA) would see Iran export 21.2 mmcfd, or 7.7 bcm per annum, with a provision to increase it to 28.3 mmcfd, or 10.3 bcm per annum, at an unspecified later date.